Corie and I have been invited to the last summer appointment of the Jam BBQ series, an evening of show cooking at the Atelier du Windsor in Bertrange. It was a warm Wednesday of September and for us it was the first time. Those of you who follow the blog probably know pretty well the level of expectations of Corie, mine not yet. Well, as it was a BBQ event, we said, let’s wait for a lot of succulent meat, grilled outside and soft to the heart, – sorry we are not vegan tonight! When we arrived, the dehors of the Atelier du Windsor was already almost full, the fires and the stove were heated on a long table made available for a show cooking with several hands (I didn’t know, mea culpa, so it was a surprise and I loved it!). I only knew there would have been a barbecue, a DJ set and a cocktail stand held by the Atelier du Barman. On one side, the bartender prepared delicious cocktails that my adventure partner and I missed out with the desire to taste the wines on display. Sigh! For starters, the waitress served us a plate of sushi. Aaah! Although I am notoriously a sushi lover, I could not hide my expression of amazement mixed with confusion. I look at Corie and read the same loss in her. Keep calm, let’s try to understand. Ok, a chat with Charlotte, the communication manager of the restaurant, and we understood that, apart from this entrée, the rest of the dishes would have provided after a nice hot bath on the grill, but no dish could be anticipated at that stage. Each recipe would have been improvised at the moment by five local and international chefs during a battle with hot forks and at the rhythm of their favorite playlists. Here, between a Cremant and a IG story, we were served the first courses: scallops and prawns with salad at Chorizo, prepared by the Luxembourger chef Guy Kohnen and then rare Oxiblue grilled, served with braised pumpkin and apple foam, all infused with ginger. A well-chosen and unusual combination with the intriguing Asian scent, prepared by François Jagut chef of Les Roses, Mondorf-les-Bains. And, listen, listen, finally the meat! Imagine the joy! The summer Jam BBQ at Atelier du Windsor was definitely a success. During the colder months, the party will move indoor, with a similar formula, for a Sunday brunch children-friendly, Kitchen Party. On the menu: show cooking, entertainment and surprises for children, cocktail bar for adults and non-alcohol cocktails for the little ones, live music … It’s happening every first Sunday of the month: October 7th (SOLD OUT), November 4th, December 2nd. Price is € 45 per person excluding drinks and a reservation is needed. Participating in a press conference always allows you to get in the mood that the event intends to transmit. This was the case of the presentation conference of Cineast, the Central and Eastern Europe Film Festival in Luxembourg held last week at the Cinématèque, that this year celebrates its 11th edition. Together with Corie on my side and with a pen and paper (I had not done it for quite a while), I took notes 😉 to give you some more excitement and insider tips regarding the Festival. In the warm atmosphere of the main cinema room and after a hot tea with croissants, the speakers told us with great humor the strong motivation that led them here. “An X-ray of the former communist countries, a story of their sociological ghosts, traditions and history through a selection of the most beautiful films from Central and Eastern Europe expressed through a new wave of Czech, Polish, Romanian cinema and in general European Middle Eastern cinema “. The words gave us an idea of the main focus of the Festival, that will kick off on October 4th and will invade the Grand Duchy (so not just Luxembourg city, but as well other areas, as Vianden and Esch and off the boarder in Saarbrucken) with its events until October 21st. We will see film contaminations and new trends that mirror the multiculturalism of the countries left by Communism, but also of their search for identity. No iconic characters, but power of images and dialogues to celebrate with this edition the centenary of the independence of the Baltics. On the menu, at the Cinemateque, Neimënster and Ciné Utopia, but also all around the capital, more than 100 films between movies and short films with a new entry: a film from Georgia, a novelty of this edition. Winter Flies / Všechno bude, by Olmo Omerzu. An international jury will award the “Grand Prix” and the “Prix Spécial du jury” while the jury will award the “Prix de la Critique”. And the public? It will also be protagonist with an important role: the spectators will be called to contribute with the “Prix du Public”. The awards ceremony will be held on October 19th at the Cinématèque. The festival will be not only an occasion to go to the movies, but also an opportunity to party, Luxembourg certainly does not pull back and will honor the countries represented with gastronomic evenings, photographic exhibitions and musical events, all to remember the precious link between film and music. The musical program starts on Friday October 5th at Melusina with the traditional Balkan Party, hosted by the Macedonian brass band Džambo Aguševi Orchestra and DJ Tagada. A few days after the Polish group Pasimito will accompany live the classic silent film Battleship Potemkin at the Cinematheque (11/10). The Baltic Party at the Rotondes will be headlining the Latvian indie rock band Polifauna (13/10) and the next day the Slovak legend of the jazz trumpet Laco Deczi will perform at Neimënster during the Jazz Apéro (14/10 in 11:00). To finish in style, the closing party will be hosted by the French group Attoft Fanfare (Melusina 20/10). The cineart program is centered around the great photographic exhibition “Identities” (4-24 October), which will take place on Thursday, October 4th from 5:30 pm in the vaulted cellars of Neimënster, festival also offers two exhibitions of film posters: Polish Film Posters: Kliś Kubica Urbańczyk at the Ancien Cinema in Vianden with modern creations for well-known Polish films (October 4-20) as well as Art_Desire_Freedom: Czech Film Posters at the Embassy of the Czech Republic in Luxembourg with original posters for films of the Czechoslovak New Wave (October 10-18). Finally, the cinema-gastronomy program consists first of all of the gastronomic evening with a large selection of Eastern European dishes and drinks on 9 October at Brasserie Wenzel. In addition, there will also be specialties and snacks available during the concerts as well as special evenings dedicated to certain countries: the evening Georgian (6/10), Latvian (8/10), Czech (9/10), Slovenian (13/10), Slovak (13/10), Bulgarian (15/10) and Lithuanian (16/10). Enjoy the show and find the detailed program here. 2018 is starting with a new chapter of the Barefoot in Luxembourg meets people column. If you follow my IG stories, you have already realized probably that one of my favourite place during winter has been La Briscola, this cozy Italian wine bar and restaurant off the station where I can relax after some very long days at work, in front of a lovely glass of Italian red wine. As it helped me so much taking the stress away in these last weeks that have been, for a reason or another, so tough, I decided starting the 2018 of our series from here, having a chat with the guys behind this concept. I met Andrea, one of the owners, at my usual table, in front, ca va sans dire, of a glass of red wine. Good evening Andrea and welcome to Barefoot in Luxembourg. Can you introduce yourself and tell us a bit about how you and your partners met? Good evening! As you already unveiled, we are four Italian guys who met through a common passion, the one for wine and Italian authentic food. We come from different experiences – three of us are working in a bank, while I am the manager of the restaurant and I have a hospitality background – and come from different places – two of us are from Lombardia, while the other two are from Friuli region. We had all since long time this dream about opening an Italian restaurant, while enjoying it, and with “La Briscola” we finally managed to do it and we are very excited to celebrate our first year of activity this Saturday (ED: more information here). What are you enjoying about La Briscola and why people should come here? “Briscola”, in Italy, is a famous card game. The name indeed is not random: we wanted to have a place where to enjoy ourselves, like during a card game, and to put ourselves in action, not just as owners or managers, but as active players. Our La Briscola is not only a restaurant, the place where you eat and leave, but, also and above all, a place where you feel home, that welcomes you when you have an argument with your partner and needs a glass of wine, when you want to relax with your friends or celebrate a great day at work, when you want to discover more about wines and take a bottle home for your sweet half or your parents. Why La Briscola should be different from tons of Italian restaurant we have already in town? La Briscola is different, firstly, because it is not only a restaurant, it is a place to meet. That means that our customers are welcome for lunch or dinner, but as well for after-work, a night-cap drink, to discuss about wines and to discover our products. Under the pure “food” point of view, then, we are proud to say that we have an offer that is completely different from the other Italian restaurants in Luxembourg: we have a seasonal, very short menu that changes every two months, including some forte that you can always find – for example: tartares. We do not propose the usual classic you might find elsewhere – the infamous carbonara or similar, – but unique, designed dishes, with a strong regional orientation. In particular, while we try to cover the cuisine from North to South of Italy, we are very keen of being almost the first in Luxembourg to present as well several dishes from Northern Italy – while the major part of our “competitors” have speciality from Apulia or Sicily. We are glad to say that probabily 90% of the products and wines you are having at La Briscola cannot be found elsewhere in Luxembourg as well as offering them at very fair prices. So La Briscola is organizing also getting together. What are the upcoming events of La Briscola? As said in the beginning, this Saturday La Briscola will celebrate its first birthday. An occasion for us to thank our customers. We are having a special dinner menu and an all-night-long after-party with DJ set. Moreover, we started already from some time the concept of Briscolino, an after-work evening once per month where our clients enjoy a cocktail or a glass of wine, taste for free our dishes at the appetizers buffet and dance with a DJ – set. Briscolino is different from the other after-works in town because we are not changing our style for the event, but we are proud to present our same, usual products we import from Italy, from Gorgonzola on the spoon to Breasola to home-made pasta dishes. Briscolino is not an evento to fill up the restaurant for one night, but for having more people trying our cuisine and come back as regular clients. Another great event we repeat on a regular basis are the Wine Talks: again, it is not just an occasion to taste and learn more about some great Italian wines, from a professional perspective, but above all an occasion to meet other wine lovers and discuss also with them about wine – a monthly “wine club”, if we want to define it so, that make clearer our idea about being not only a restaurant, but as well a reference for people passionate about wines. In fact, for example, during our Wine Talks, you have a chance to buy our wines – that are on sale normally at the restaurant anyway – for a discounted price. So one year passed already, where do you see La Briscola in 1 year? Our first year was basically to get known, that might not be easy considering that we are not in a fashionable area of the city. We want to continue to propose our Briscolino and Wine Talks and we have great surprises coming – for example the Italian Sunday Brunch and the kitchen open all Sunday afternoon for Italian football matches – or, if you don’t like football, just if you are too lazy to wake up on time for the brunch on Sundays. 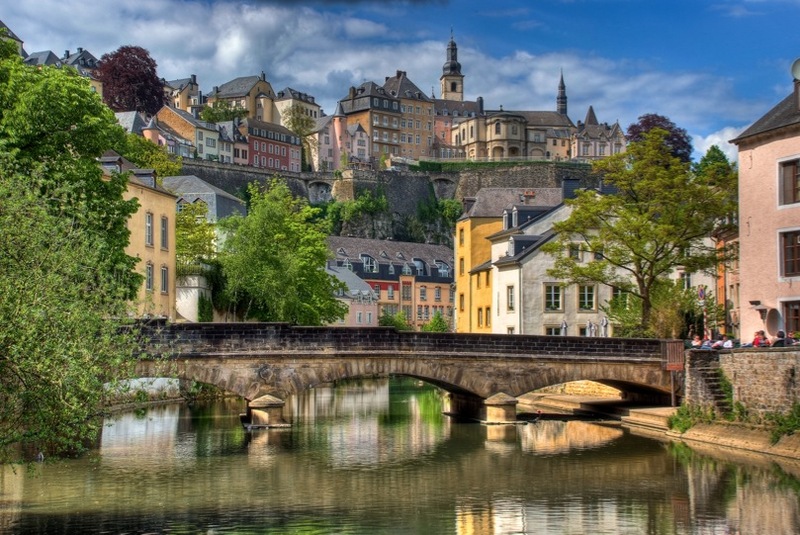 Coming back to your Luxembourg background, how long have you been in Luxembourg? I came to Luxembourg one year and a half ago for opening La Briscola. I was convinced by my other three partners in crime, who have been here for more than three years and know I was getting myself into real trouble moving here (laughing). What is the place that has the most special memory in the city for you? The bridge on the Alzette in Grund…one of the first places I saw in Luxembourg and still my favourite one. Out of interest, and taken La Briscola out of the candidates :), what is your favorite restaurant in town? I recently went to Tomo, a sushi place in Merl and tried their special menu with marinated sushi at the bar in front of the chef. In my opinion the best sushi in town! What about your favourite night-life spot? Being a pub-lover, Steiler is definitely the place I go on the weekends to enjoy a good atmosphere and good music. What do you like about living in Luxembourg? What I enjoy the most about Luxembourg is its international environment, which is something you can experience in very few cities in Europe. Lots of people are moving here from all over the world and are very open to make friendship. Going from bar to bar at night, you can easily spend the entire time with people you met on the spot, which is something that rarely happened to me in other cities I lived in before. What do you miss most about living in Luxembourg and would change about the life in Luxembourg? As Italian, the only thing I really miss is a better, sunny weather! Seriously, I hope the city will continue to grow and to increase the offer for entertainment, which is definitely needed, considering the relatively young age in average of people that have been moving to the city in the last years. International, cosy and forward looking! Thank you very much Andrea and See you at La Briscola!